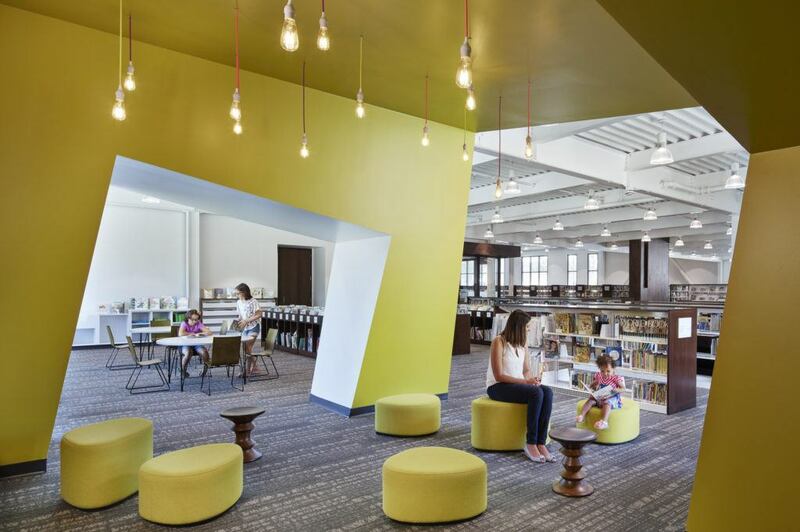 The Columbia Heights Library in Columbia Heights, Minnesota, has won the prestigious 2018 Library Interior Design Awards for Public Libraries (30,000 square feet and under). 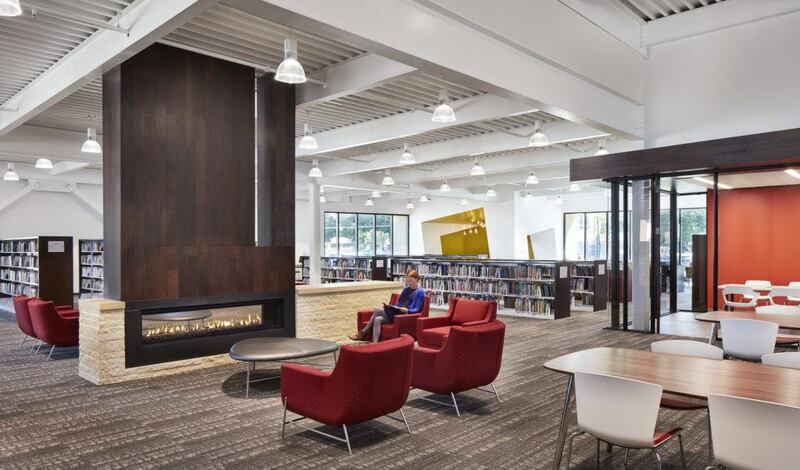 Sponsored by the International Interior Design Association (IIDA) and the American Library Association (ALA), the biennial Library Interior Design Awards recognize achievement in library interior design aesthetics, creativity, and function. Prominently located on a major crossroad in downtown Columbia Heights, the 22,600-square-foot, single-story library includes adult, teen and children’s areas; conference rooms; computer stations; and 80-seat community meeting room with after-hours access. The library stretches horizontally along its site, reinforcing the urban streetscape that includes low-rise commercial buildings and the historic Heights Theater. A central entrance lobby connects with library resources on one side and the community room on the other side. Inside the main library, space planning aligns along a central spine that connects visitors with digital and print learning resources. The light-filled interior includes exposed ceilings, glass-framed conference rooms, wood panels, expansive windows, central fireplace with clustered seating, and neutral tones with splashes of color in the carpeting and seating fabrics. With a focus on sustainable learning and community stewardship, the library participated in Xcel Energy’s Energy Design Assistance (EDA) program to incorporate energy efficient-strategies. Raised-access underfloor mechanical and electrical systems allow efficient air supply and electrical and telecommunications adjustments. High-performance glass with frit patterns reduces solar gain, and a landscaped bio-retention area absorbs and cleanses rain run-off from the parking lot. Entries were judged by a panel of interior design professionals, including Stasia Czech Suleiman, IIDA, NCIDQ, Vice President/Senior Project Interior Designer, HOK; Jeannette Lenear Peruchini, IIDA, LEED AP, Associate Director and Interior Practice Leader, Skidmore, Owings & Merrill LLP; Jessica N. Kayongo, J.D., M.A., Sociology Librarian, Hesburgh Libraries, University of Notre Dame; and Mindy Sorg, IIDA, NCIDQ, LEED AP, RID, Associate and Senior Interior Designer, OPN Architects. The awards were presented at the ALA Annual Conference June 23, 2018, in New Orleans. See all the winners at the International Interior Design Association. 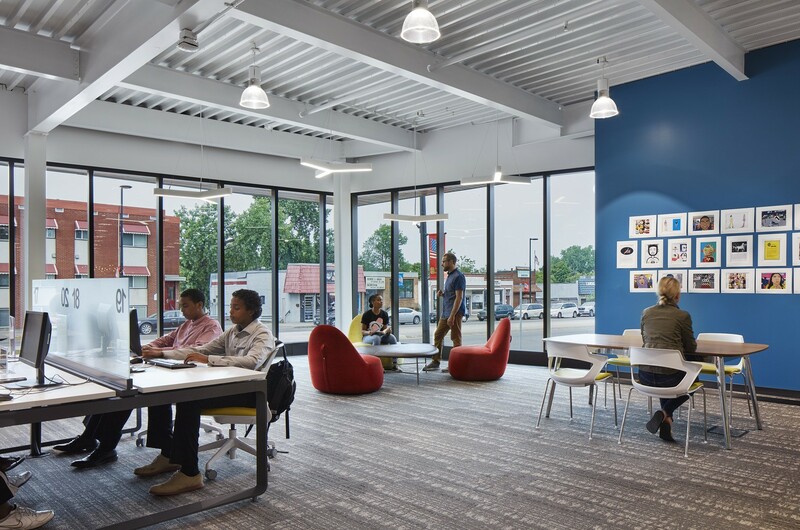 The library is conceived as a community gathering place that offers multiple opportunities and flexible spaces for individuals and groups to come together to learn, enjoy, interact, and share common goals.